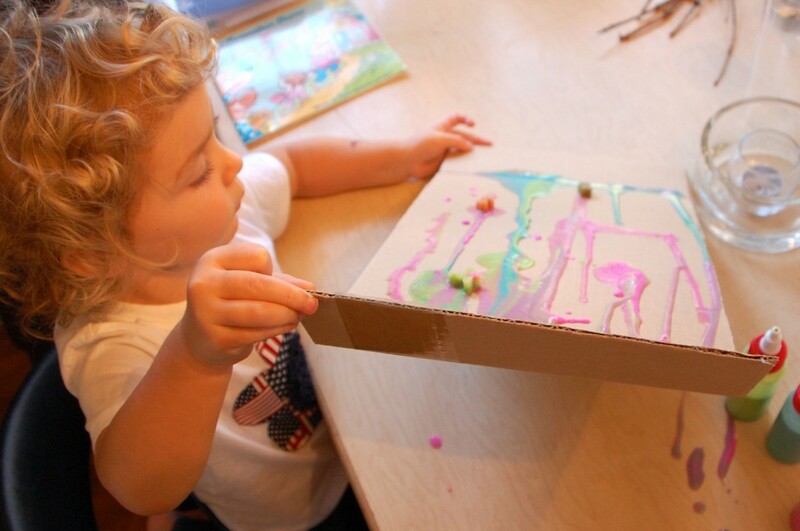 Making your own homemade paint with kids is a rewarding process that helps children understand that store-bought is not the only way! 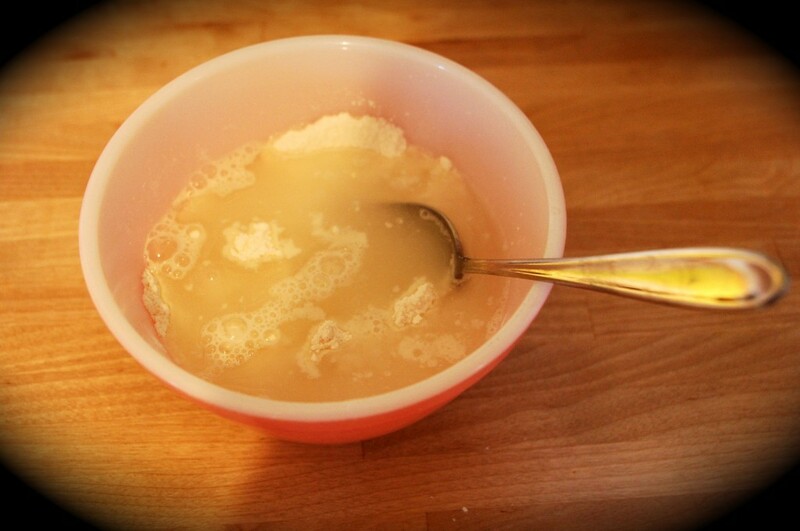 Using a combination of salt, flour, and water, this recipe is beyond simple. 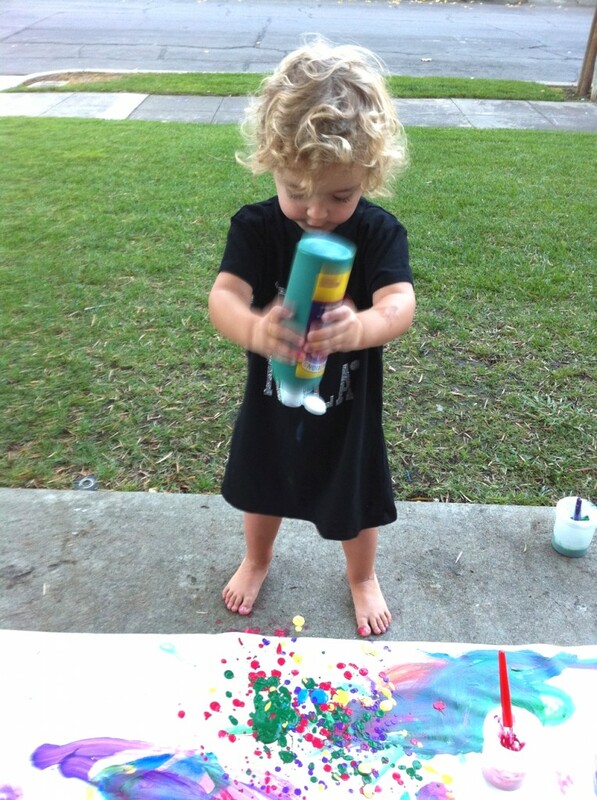 My toddler is at that stage where she loves squeezing paint out of the bottles. 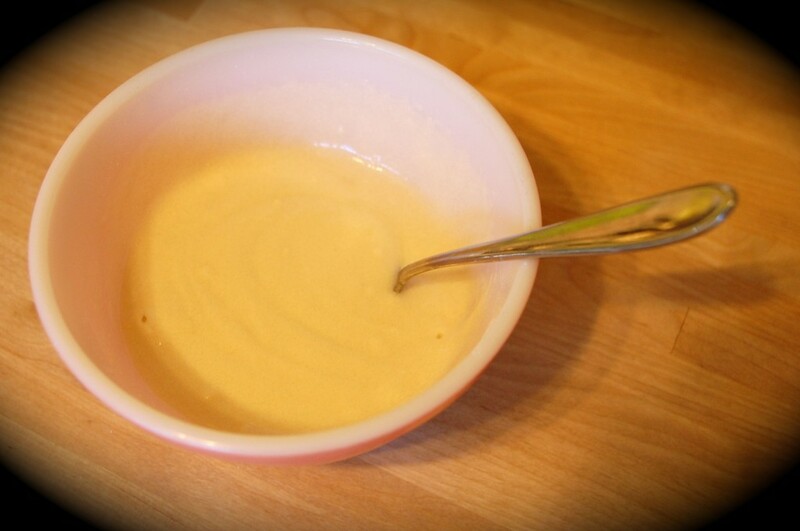 I gave into this to give her the chance to explore this phenomena, but after using an inordinate amount of paint in the process, I thought it might be more frugal to make a batch of homemade salt and flour paint for more economical squeeze painting. 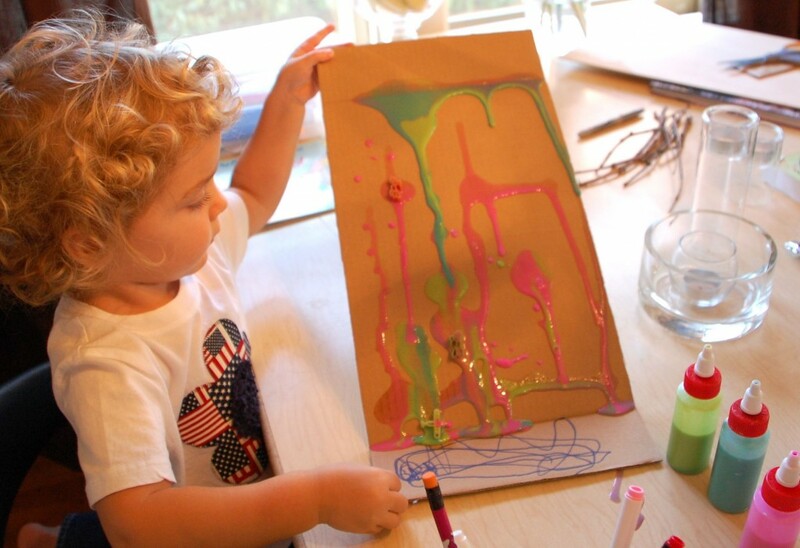 This homemade paint recipe is simple, non-toxic, and it costs next to nothing to make. 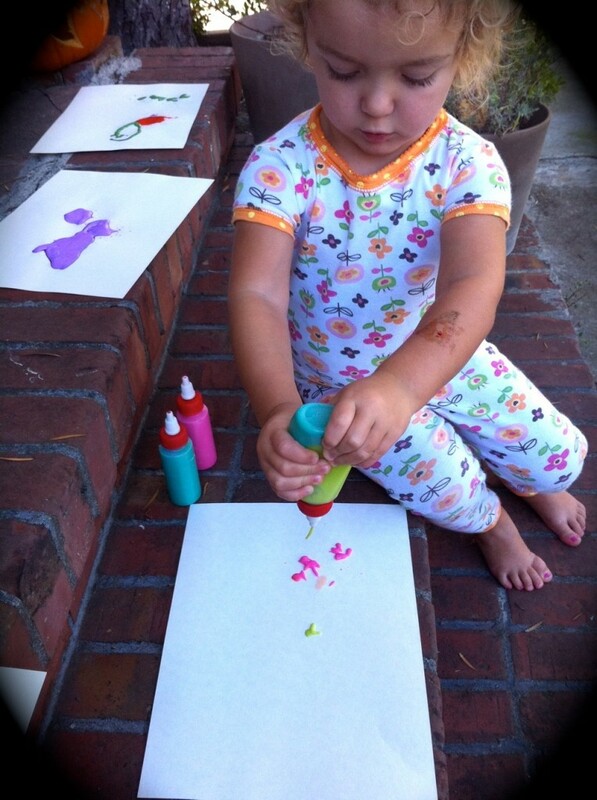 Not to mention it’s pretty rewarding to make your own art materials. I made these while my daughter was napping, but next time I’ll include her in the process. The following recipe makes enough paint to fill 3 2 ounce bottles (affiliate). Keep in mind that this paint is perfect for exploring the process of painting, but it’s not great for creating a masterpiece to hang above the mantle. In essence, it’s not a tempera or acrylic paint replacement! 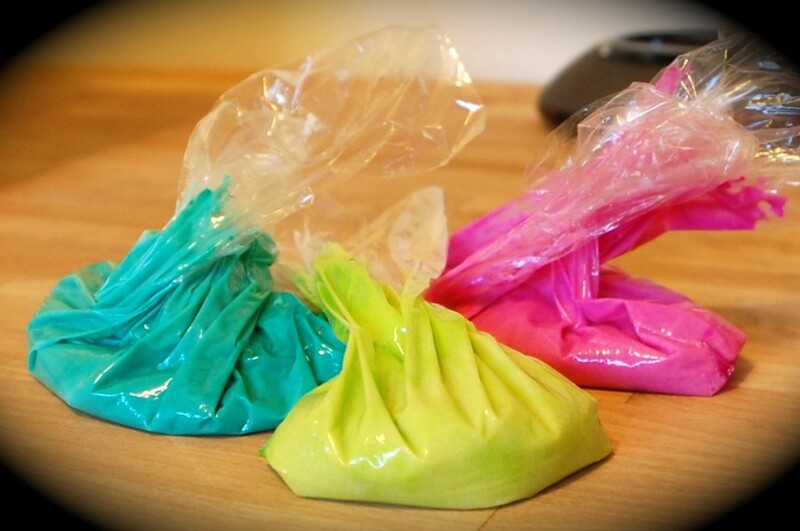 Divide it up into three sandwich bags and add a few drops of liquid watercolor or food coloring to each bag. 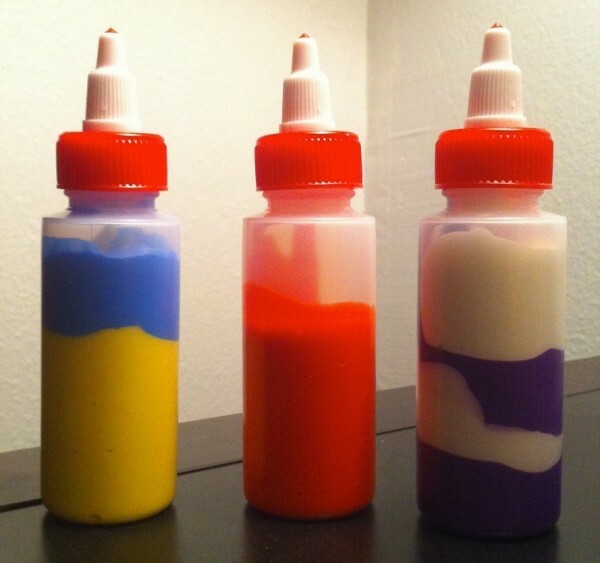 Squish them up until the “paint” is well blended. Use Ziplock bags if small children are helping with this step. Add more water if you’d like a thinner paint. 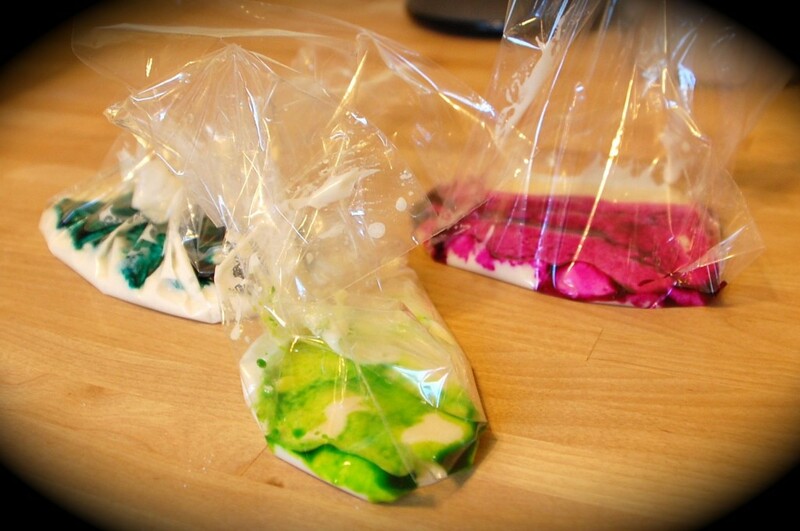 Cut a corner off the baggie and squeeze the paint mixture into your squeeze bottle. This homemade paint came out pretty thick, and was a little hard to squeeze. Next time we’ll dilute it with a bit more water. The good news is that the paint dries quickly. 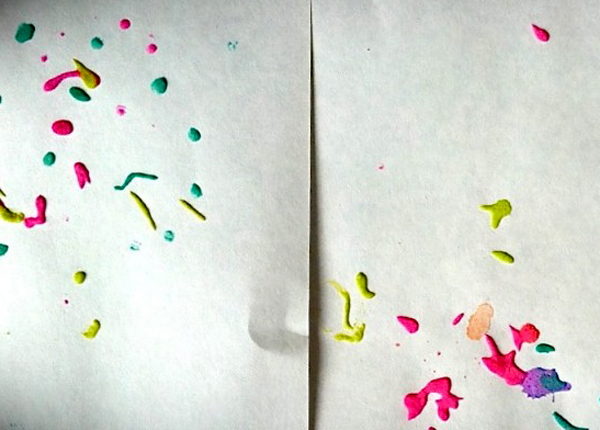 The squeeze paintings we made with regular tempera paint (2 days ago) are still wet, while these are already completely dry! And they have a nice puffy, sparkly texture too! 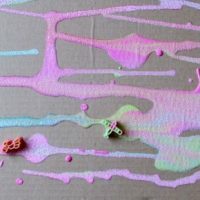 What’s your favorite kind of paint and/or painting process? 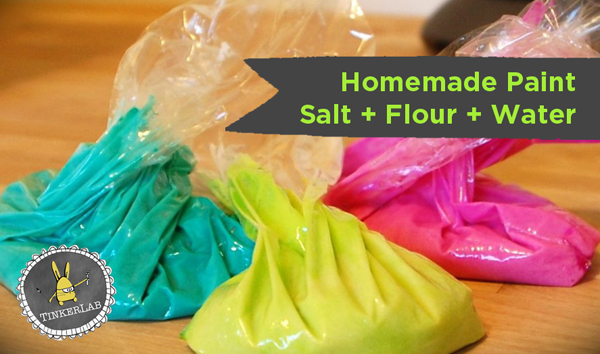 Our favorite toddler art recipe homemade playdough. 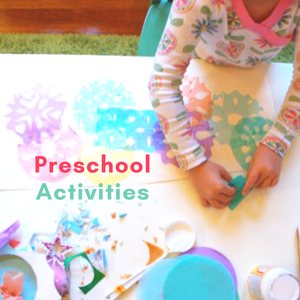 It’s easy to make, non-toxic, and inexpensive. This recipe has been successfully used thousands of times. 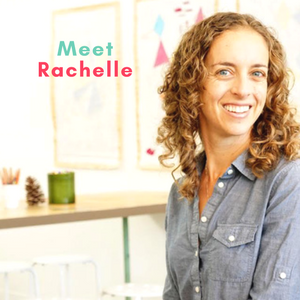 I set N up with some paint pots and a large sheet of paper — our favorite way to paint big as of late. 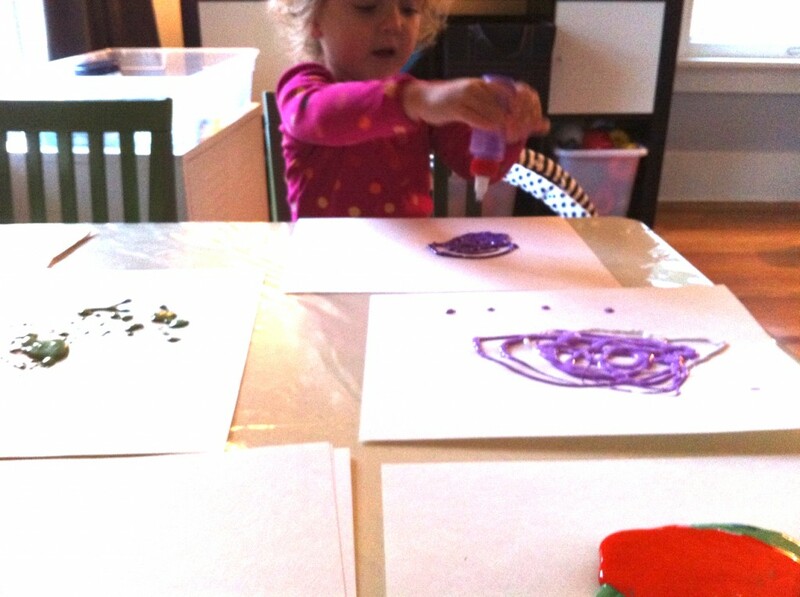 After smearing some paint around and taking a few stabs at mixing colors, she asked me for more purple paint. The paint pot wasn’t empty, and the real story ended up being that she wanted to SQUEEZE more paint into the paint pot. Of course she did! 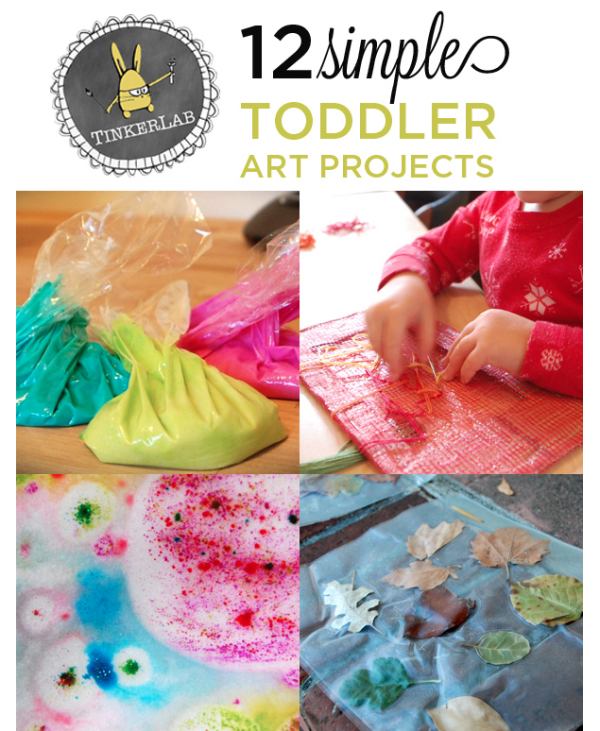 Toddlers adore squeezing, as we’ve noted with glue bottles, water bottles, and glitter glue. So I handed her the bottle, and the following drip and splatter-fest took place. At a later point I encouraged her to walk through the paint to make footprints, which unfortunately led to a messy paint disaster that included falling into a big slippery puddle of paint. This led to laughing and commotion, but since my hands were then full with towels and buckets of water, I’ll spare you the image and leave the result to your imagination. 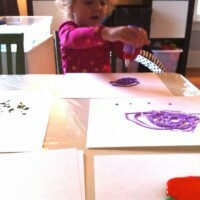 The timing was perfect because I just ordered a set of Nancy Paint Bottles, and they arrived late in yesterday’s mail. After N went to bed I filled them with paint, ready for morning squeezing experiments! 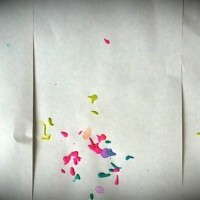 The splatters that came out of the almost empty bottles were rewarding in their own way. 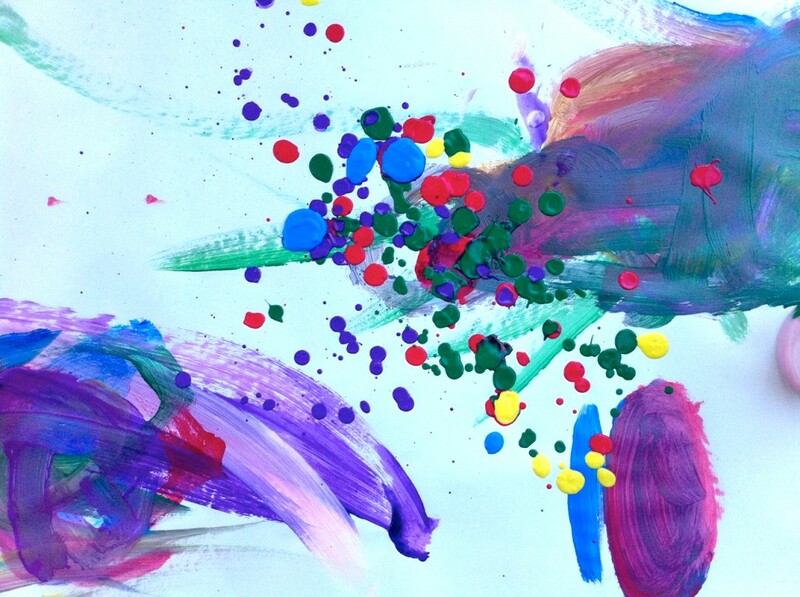 This isn’t the most economical way to use paint with a squeeze-happy toddler, but as she gets older I’m sure she’ll become more judicious with the paint pouring. 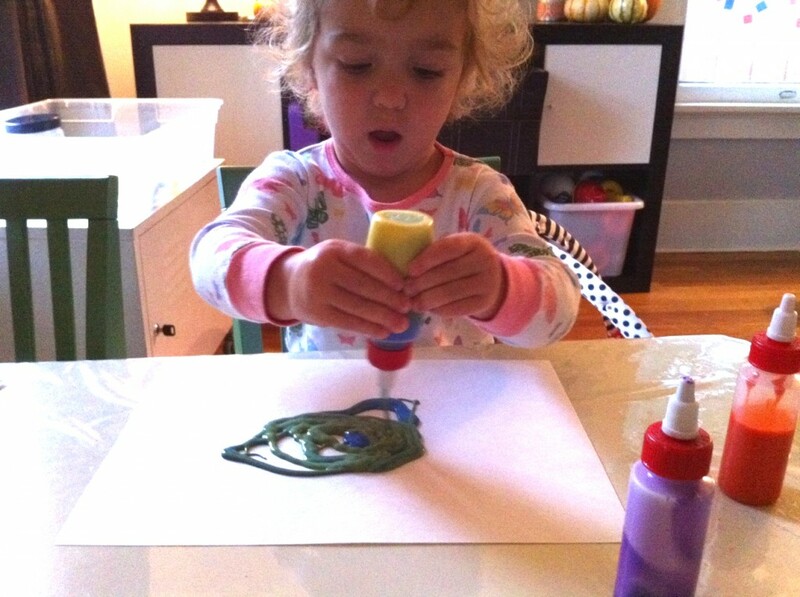 I also envision other squeeze bottle experiments with glue, flour mixtures, and liquid watercolors. 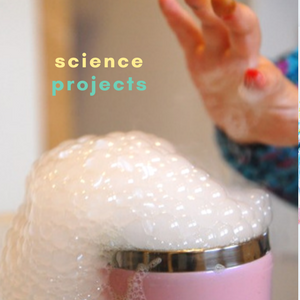 What kind of squeeze bottle experiments have you had in your home or school? 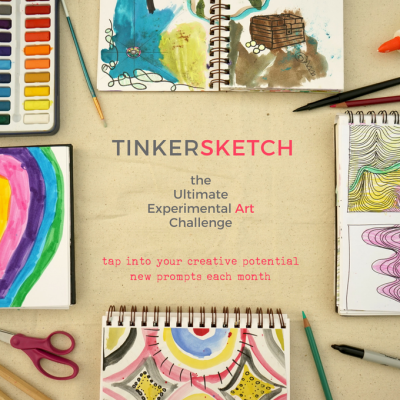 Do you have any other ideas for materials that could be squeezed?